It took about 10 minutes to catch this stray cat by the Inn Between Tavern just south of Botkins, recently. 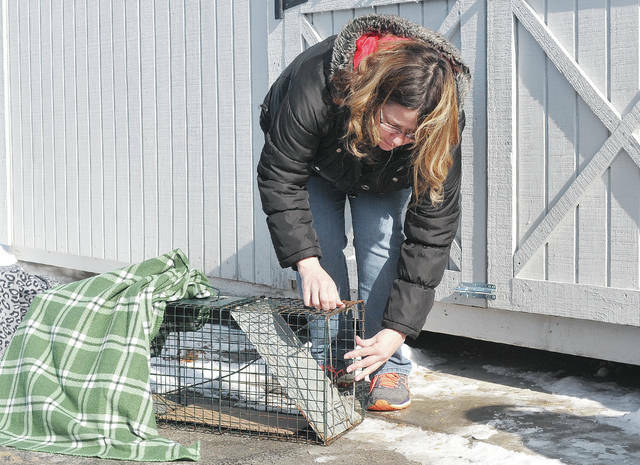 Amy Simindinger, of Sidney, puts out traps, recently, in the hope of catching feral cats near Botkins. The captured cats were neutered and released. Simindinger chairs a volunteer group who have scheduled seven dates this year for the trap-neuter-release program. A trap is set next to a storage shed behind the Inn Between Tavern just south of Botkins, recently. Foster kittens have a good time with Zoey Simindinger, 12, daughter of Amy and Scott Simindinger, of Sidney, in the family's home, recently. Zoey, her mother says, is a cat whisperer. • Report areas where feral cats are a nuisance. • Volunteer in the trap-neuter-release progra. For information, call the Shelby County Animal Shelter at 498-7201. SIDNEY — According to Amy Simindinger, of Sidney, her daughter, Zoey, 12, is a cat whisperer. She can get cats to do things when other people can’t. So it’s not surprising that Zoey likes to look at cat videos on the Internet. And that’s where she found out about the kitten lady. 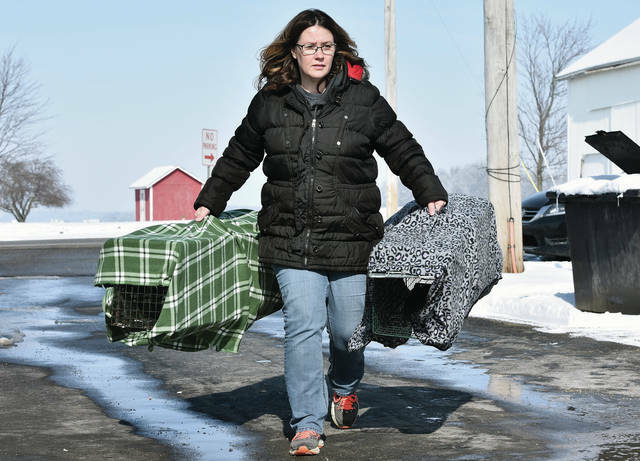 Hannah Shaw, of Spring Valley, California, is a professional cat rescuer, advocate and author, who led a rescue workshop in Dayton in January. “Zoey looks up to her,” Simindinger said, recently. The Simindinger family provide a foster home for abandoned kittens, and Amy coordinates a volunteer group who run a trap-neuter-release (TNR) program in conjunction with the Shelby County Animal Shelter and the Shelby County Animal Rescue Foundation. “Hannah is an inspriation to Zoey, so going to see her was a birthday present for Zoey,” Simindinger said. “The whole thing was a surprise,” Zoey said. “It was really nice to know more about trap-neuter-release and to talk about fostering kittens. She taught me how to put a trap up.” The two got to sit down with Shaw for a half-hour question-and-answer session. Simindinger said Shaw’s talk made her feel better prepared to advocate for why TNR is right for Sidney. Mother and daughter have been involved in TNR here for several years. 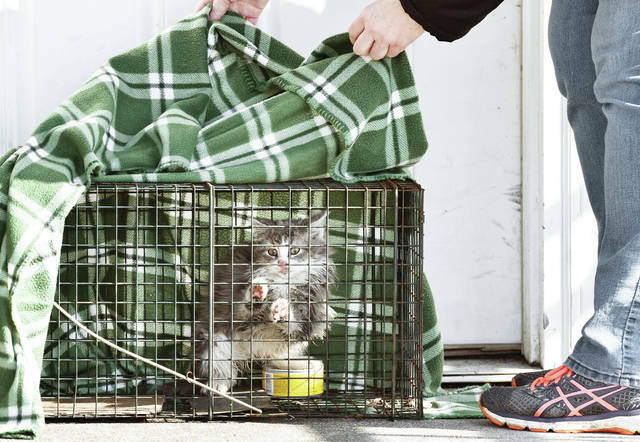 The program relies on volunteers to trap feral cats, who are neutered and released again. 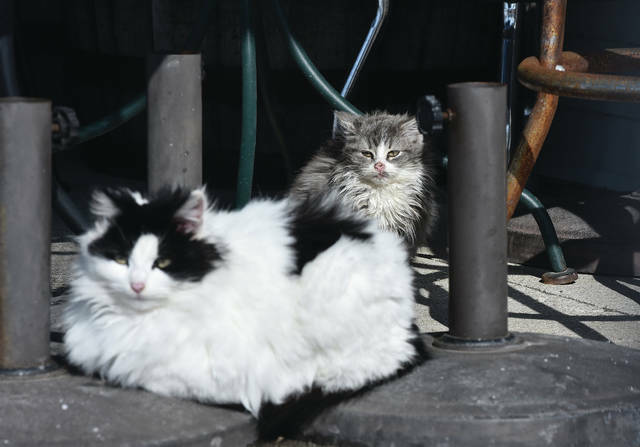 The practice drastically cuts down on the number of cats roaming through neighborhoods. Within a week of the Dayton workshop, Simindinger and Zoey were out with the volunteer group to trap the strays in several areas of Shelby County. “We were out for 11 hours and trapped 26 cats,” Simindinger said. “It’s a good way to spend mother-daughter time. Some people go shopping. We trap cats. Shelby County Sheriff’s Deputy Kelli Ward, who is the dog warden and manages the animal shelter, said the TNR program has “definitely been beneficial. “We’ve prevented a lot of cats from being born. We’ve definitely seen a decrease in the number of cats brought to the shelter. We’ve started seeing a lot of areas where people have said there were a lot cats and now there are not so many. Amy and her daughter have been awesome. They’re awesome fosters, too,” Ward said. “The goal is saying good-bye, but sometimes it’s hard,” Zoey admitted. The family find homes for the kittens they foster. “When you put all that time into raising them, you want them to have a good, long life,” Simindinger said. 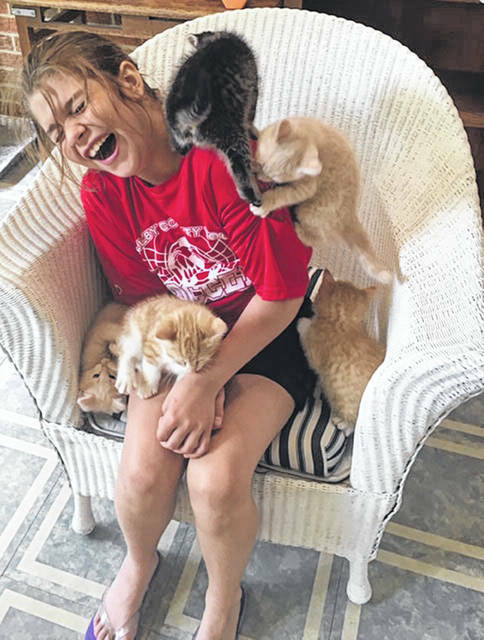 Foster kittens have a good time with Zoey Simindinger, 12, daughter of Amy and Scott Simindinger, of Sidney, in the family’s home, recently. Zoey, her mother says, is a cat whisperer.